Why We Came to the City is one of those books about a group of friends navigating life in their twenties and thirties. This story centers around vivacious Sara Sherman, who works as an editor, and her awkward astronomer boyfriend George Murphy. They hold on tightly to their two best friends-artist Irene Richmond and poet Jacob Blaumann. The four friends expect the usual ups and downs of relationships and careers, but they are forced to reevaluate everything when one of them becomes seriously ill. The novel is based around the title. The book opens by noting the slightly stubborn persistence of college graduates who live in a city where you pay too much for rent, and make too little in your paycheck, and try to find friends while simultaneously missing home and vowing to never return. Kristopher Jansma perfectly captures the feeling of throwing all of yourself into a new life in a new place and then discovering just how much you get in return. As you read, you can feel as the characters are slowly and surely weighed down by the harsh realities of life instead of experiencing the happiness and opportunities they were sure would come to them. This book probably can't escape from comparisons to A Little Life and The Interestings, but this book succeeds in being less soul crushing than the first and, dare we say, more interesting than the second. Of the three books, it tackles the question of "being special" head on. Many of us grow up as big fish in small ponds and then we move to the big city and find that what made us shine in a class of 100 or get the lead role in a drama department of 40 doesn't get us a job at all. Each of the characters here are explicitly told that they are not special and it is that moment, as they are each doing their best to do good work, care for their loved ones, and still get a few hours of sleep, that each of them grasps an important and terrible lesson. "...those three words stuck in Sara's side like tiny prickers. For she was special, and had always believed it. She was more punctual, and she was better prepared. Driven harder and by purer purpose. Kinder to others and more loyal...And yet she couldn't save Irene by trying hardest or being best. Because no one was immune to tragedy. No matter how respectfully Sara lived, death could not respect her in return. She, Irene, all of them were susceptible to collapse, regardless of preparations or punctuality or propriety. None of them were special." Why We Came to the City bounces from viewpoint to viewpoint as we discover what is really going on in the heads and hearts of each character. The writing is insightful and lovely, to the point that you may find yourself wondering if Jansma has been eavesdropping on your conversations about the frustration of your job or the evolution of a friendship. 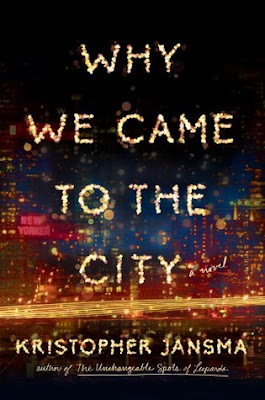 This is a book for the reader who loves great writing, for the man setting off for a big adventure in the city, and for the woman wondering why she went to the city in the first place. This sounds good! I hope I can find time for it. I loved this books so much! Like you, I found the writing very insightful and I also really loved how real the characters' experiences felt. It's Monday and what a weekend it has been! It's Monday and I have a book nook!